1) How do we talk to people, loved ones, friends and family in a meaningful way about Jesus? About eternity? About Jesus coming back? 2) How do you share with someone that Jesus is our Saviour if they don’t think they need salvation? The answer seems to point to prayer…. which could seem to some to be a passive answer! But is it a passive answer? Or is it a powerful answer? Ask and it shall be given to you…. The effectual fervent prayers of a righteous man avails much…. before we see the physical landscape change! 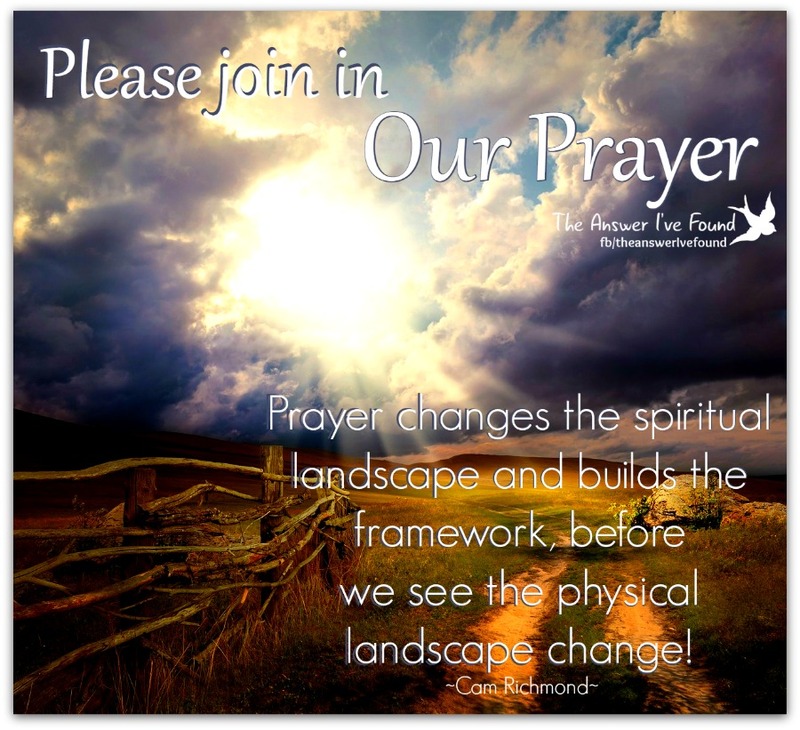 Have you seen people come to faith through prayer? How do you pray for your friends and family? Do you have a list? I have been wondering how to fit everything into my life? I need to pray more! So I have been coming up with a prayer that could encompass everything and everyone. A prayer that I might pray daily and then as God leads me to pray specifically for other people. My mum was a prayer warrior, she was down on her knees every day interceding for people with all kinds of needs. It seems to me that prayer is the precursor to miracles! Just think about it like that! Do I pray enough? The answer clear and simple is NO! Father we come to you in your precious Name. Lord we bring our needs before you, and we know that you indeed hear our prayers. Lord your heart is for all the people’s of the world, no matter where they are, no matter who they are, there is nothing that prevents your very great love from touching them and changing their lives. Lord right now we bring to you our families and friends. Lord you know each one by name. We bring our parents, our grandparents, husbands and wives, our sons and daughters, our sons and daughters, our brothers and sisters, our aunts and uncles, our cousins, nephews and nieces to you. Father we bring before you our neighbours, our communities, we bring people of every denomination to you. We bring our friends and all their families, their children, everyone from the local shop keepers, teachers, all our emergency service workers, cleaners, and maintenance people, all medical people, engineers, our employers, our co-workers, we bring people in every walk of life and in every corner of the world to you. We bring professional people and intellectual people, people with great minds, the great thinkers and we also bring simple people to you. Lord we bring to you ever poor person, every rich person, every homeless person, Lord we bring every person that has some kind of disability – no matter how severe, we bring all service men and women, we bring our governments and our politicians to you, we bring religious leaders to you and community leaders to you. Father we bring criminals to you, we bring terrorists to you – no one is above or below your free gift of salvation. We bring the hurt, the lame, the deaf, we bring even those in comatose states and in any kind of institution. Lord we will not forget addicts and recovering addicts and the mentally ill, all people who are degraded and misunderstood. Lord we bring the young and the old, we bring the sick and the well, we bring both people who don’t believe and people who do believe to you. Lord we ask that you will open every ear, every eye, every heart. Father no one is beyond coming to know You. Lord you are the creator of the world, the Alpha and the Omega, you are the beginning and the end…. We pray that you would stir the hearts of all your sons and daughters, awaken them from the things they are doing and prompt them now to share your very great love with those around them. Give them a taste of the urgency of your love wanting to meet people where they are at. Lord we thank you that you send the Holy Spirit out now to minister to every single person, all around the world, let there be a softening of people’s hearts, show them the need that they have for you and that the world has for you. We pray for every person that is falling into any kind of deception and false sense of security that they would see, that they would hear… Now is the time of salvation! Please share this prayer with anyone you like, save it and keep it on your computer. This prayer is to be shared and passed around, if it helps you pray and cover most things then you are welcome. Please add to it where you want, change it, make it fit your family! family, life, people, Prayer, talking to God. Bookmark. So true. Prayer has been and always will be my lifeline to God.